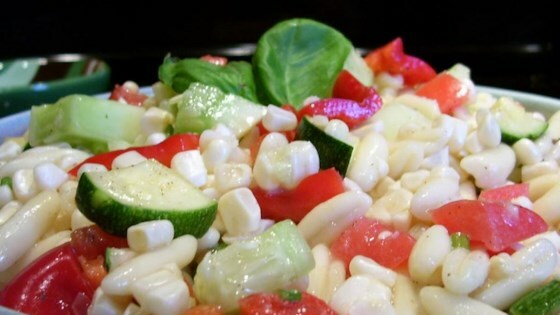 "My son in-law makes this salad during the summer. It is so refreshing on a hot day." Corn, sweet onions, and jalapenos combine into a spicy summer salad. I really thought this sounded good but it didnt go over well at all in my family , not sure what it is exactly but something just didnt taste right. Colorful and flavorful! Perfect for summer. I added a lot of chopped, fresh basil. It was a big hit. This is good. I used canned and frozen corn, and used fat-free italian dressing. Very good. What a change from a pasta or potato salad. Looks great and definitely is FRESH tasting. Agree with a previous review, it needed more dressing. We also added tons of fresh black pepper.